Imagine if life felt like a dream sequence, with the softest of voices narrating every thought. Somewhere in this image we get Mosquitos, the Brazillian trio who are sharing “Counting The Days”. Self-described as “tropicalia-punk-folk”, this video certainly fits the description, with the encompassing warmth of tropical tones and influence that meet the friendliness of folk. In the new video, we find the band frolicking with friends in the charming green of tall grass, with a haze that brings infinite calm with the greatest of ease. 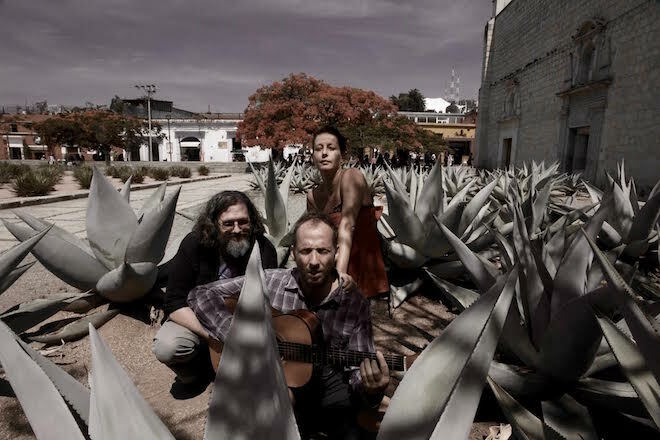 The band are vocalist Juju Stulbach, vocalist and multi-instrumentalist Chris Root, and keyboardist-programmer Jon Marshall Smith – three lifelong friends who have spent the last ten or so years bouncing between Rio de Janeiro and Oaxaca (this photo finds them in a patch of ripe agave). Their fourth album, Mexican Dust, is out now on Six Degrees. Watch below and be wooed.